Have you ever been judged and ridiculed by someone who’s opinion you valued? Maybe it was a girlfriend, a family member or possibly even a significant other. I shared an opinion during this week that one of my ‘friends’ decided needed correcting. This ‘friend’ assumed where I was coming from rather than asking me what I meant, and then she became my personal judge and jury. And she did it all in front of an audience of her peers. Apparently my hypocrisy needed to be exposed. Well thank you very much for taking it upon yourself to do that for me but if I wanted you to do that I would have asked. Ha ha ha. How arrogant can a person be? Now I know that her opinion is a reflection of her and that it really has nothing to do with me, and honestly, she wasn’t a close friend. What happened though really got me thinking about the way in which we can spoil the relationships that do matter to us. Seriously girls, how old do we have to be before we stop doing this to ourselves and to each other? It’s sort of understandable that it happens in school because we are young and learning how to manage our emotions. Our emotional IQ hasn’t fully developed. But if it is still happening when you are an adult you missed a memo or two. 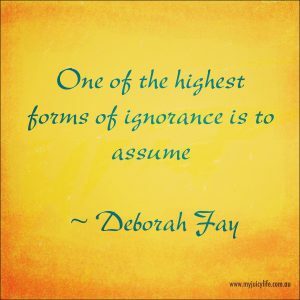 Assuming is one of the highest forms of ignorance. It reduces us to 2 dimensional characters and when it is used to minimise others and draw attention to ourselves it is just plain ugly. Worse than that, however, is the fact that opportunities are missed, and sleep is lost while bridges are crossed that never actually eventuate into reality. All because many assumptions are incorrect to begin with and like the busy little bodies we are, we create dramas that needn’t exist. Until I became a counsellor, I used to think I knew where people were coming from. But when I learned how to listen one of the most astounding things I experienced, and still experience to this day, was the fact that I could ask the same question of every client I saw and get a different answer EVERY SINGLE TIME. Something else I have learned since becoming a counsellor is that when you learn to separate fact from fiction in any situation, it is not what is really going on that causes us the most pain but rather it is the fiction – what we think is going on – that causes us the most pain. I still think I know what people are going to say when I ask them questions but I know enough now to suspend my thoughts long enough for the person in front of me to astound me yet again with a completely different answer. It always happens. People really are so much more interesting and complex than we assume them to be. And when I think of all the times I assumed things about others and acted on those assumptions I now wonder what I have missed as a result. I have learned so much more from asking questions than I ever did by assuming I already knew the answers. 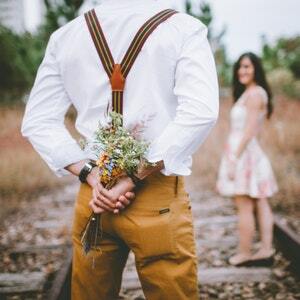 Perhaps next time you assume something about someone you might like to ask them a question instead and find out more about why they feel the way they do or act the way they do. You might be amazed at what you learn and your life might open up instead of remaining closed and 2 dimensional. PS: The person who judged me has a favourite saying, “Try walking in my shoes before you judge me”. How ironic is that?